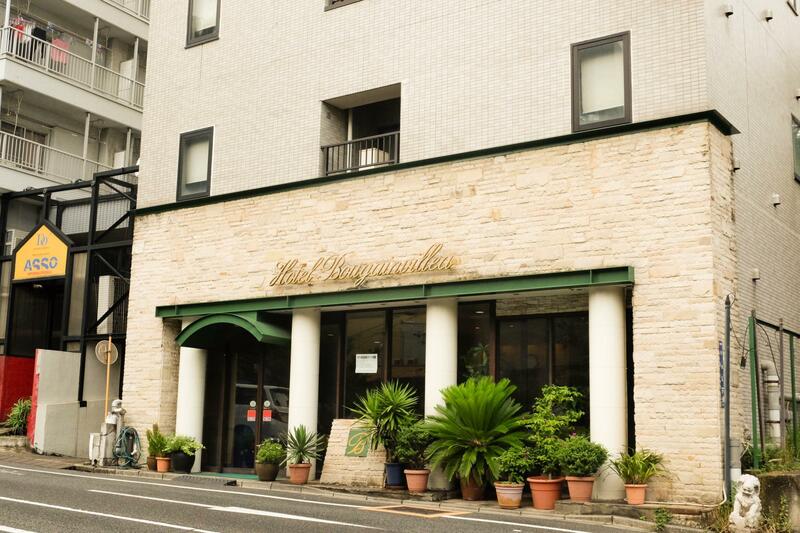 Jika apa yang Anda cari adalah hotel yang terletak strategis di Tokyo, carilah Hotel Bougainvillea Akebonobashi. Pusat kota terletak hanya sekitar 2.0 km dan bandara dapat ditempuh dalam waktu menit. Yang tidak ketinggalan adalah akses mudah dari hotel ini ke sejumlah obyek wisata dan landmark kota ini seperti Kedutaan Besar Republik Benin, Aikikai Foundation, Kedutaan Besar Luksemburg. Dengan menawarkan pelayanan superior dan sejumlah fasilitas kepada para tamu hotel, Hotel Bougainvillea Akebonobashi berkomitmen untuk memastikan penginapan Anda senyaman mungkin. Ada beberapa fasilitas hotel ini seperti layanan kamar 24 jam, layanan kebersihan harian, layanan pos, penyimpanan barang, koran. Sebagai tambahan, semua kamar tamu memiliki sejumlah kenyamanan seperti televisi layar datar, lantai karpet, kopi instan gratis, cermin, sandal untuk menyenangkan semua tamu. Hotel ini menawarkan berbagai pengalaman hiburan unik seperti pijat. Dengan lokasi dan fasilitas ideal yang setara, Hotel Bougainvillea Akebonobashi dapat memenuhi berbagai macam hal. Dua anak di bawah 5 tahun akan dikenakan biaya seperti 1 dewasa. 7 eleven sangat dekat. Utk mencapai hotel ada bagian jalan yg menanjak, tapi kami berhasil mendorong 2 kursi roda ortu saya. Yg sulit jika ada tambahan kopor byk. Krn itu dari hotel, kami sewa kendaraan menuju airport utk memudahkan. Krn sulit kalau hrs bawa kursi roda dan bagasi sekaligus. Staf cukup ramah. Ada microwafe di lobby, jadi bisa minta tlng staf utk memanaskan makanan. Ada kopi, teh, masker, shower cap, cotton bud gratis di lobby. Kami senang tinggal di sana. Kami bisa menitipkan kursi roda di lobby. Lift sangat membantu, mengingat kami bawa lansia. Di dekat hotel ada bbrp rumah makan ikinari steak enak (walau agak sedikit lbh mahal), ada rumah makan sejajarnya family mart yg di seberang exit A2 (enak meat bowl dan daging burgernya) dan ada bbrp mini swalayan spt 7eleven, Lawson, lawson 100, family mart, santoku dll. Hanya 2 perhentian ke stasiun sinjuku. Keseluruhan kami menikmati hotel ini. Near akebonobashi Station from exit A2 and mini mart also restaurant. Have a good sirculation air. Letaknya dekat dengan stasiun Akebonobashi dan cocok untuk anda yang tidak suka keramaian. Ada restoran nasi curry (karidon) CoCo dan teriyaki/tempura don Tenya sekitar 200 meter dari hotel. 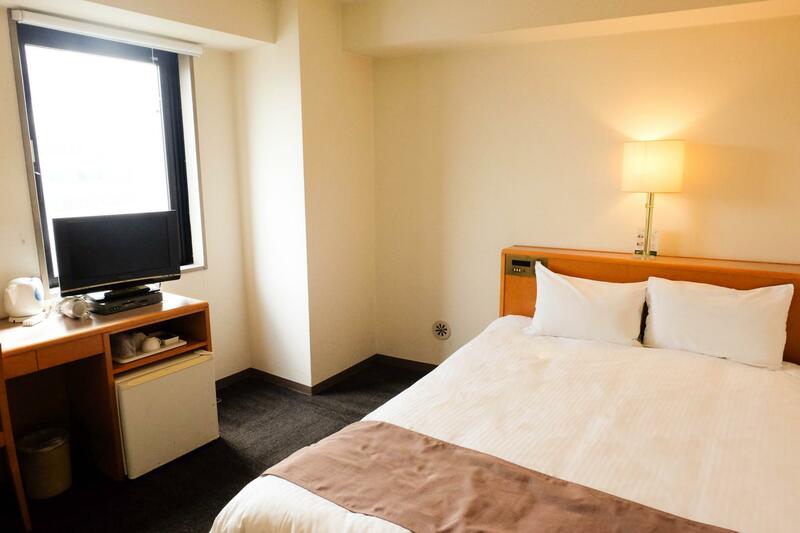 This hotel was minutes away from the Akebonobashi station which runs on the Shinjuku line, so it was extremely convenient. On the way to the station, there is also a 7-11. We were able to grab some onigiris quickly before venturing out all day. Room was pretty big considering it's central Tokyo--much bigger than the first hotel we stayed at. Full bath with complimentary toiletries. We saw all the staff because we would come back at random times of the day. Everyone was very polite and accommodating. Definitely would recommend! 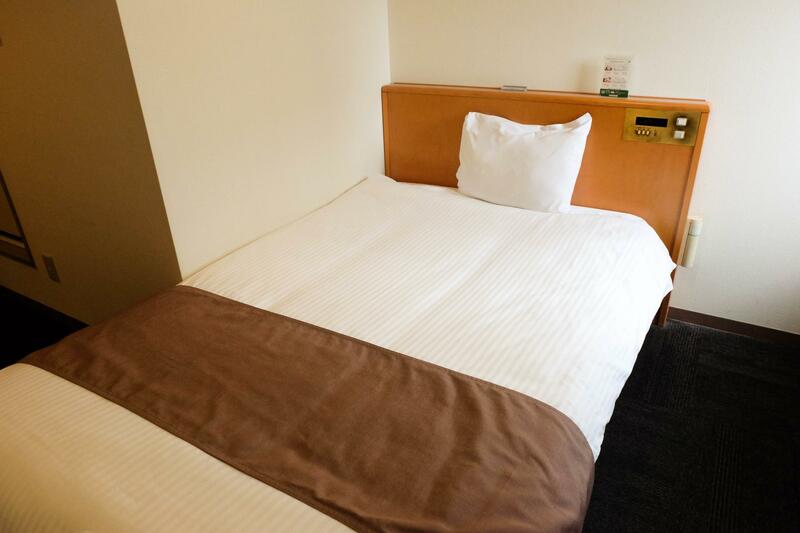 If you are traveling to Tokyo, smaller rooms are a norm. This hotel has a small room but can conveniently fit 2 adults with luggages, you just have to be strategic in the way you position the bags so you can still open it and still have space to move around. Location is also good as there is 1 subway station nearby (Akebonobashi station along the Shinjuku line), which makes it convenient to travel around. There are also several convenience stores nearby and restaurants you can visit for a good meal (Coco Ichibanya and a Tempura place). Several banks/ATMs as well for your cash needs. Hotel is a little old and the room was musty, but the price is very competitive. Very close to the Akebonobashi metro station just 2 stops from Shinjuku from where you can get to anywhere in Tokyo. Not much around the hotel, but did manage to find some nice places to eat and relax. I recommend this hotel for anyone on a budget. It is very competitive for the price. This is great value for money! This is a nice area of Shinjuku. You need to catch the subway across the road (2 stops) to get to JR Shinjuku station and the central hub of Shinjuku (otherwise its about a 2km walk). The room is clean and the staff are nice. One thing to be aware of is there aren’t many restaurants around so dining near your accomodation is limited. It's a cheap hotel, and our room was big enough for the two of us. Everything was clean enough but not "sparkling" clean, there were some wallpaper bits coming off, a bit of the shower curtain was mouldy but the bed was clean and that's mainly all we cared about. The location is OK, not too far from the station, around a 5 minute walk, but there is nothing around that station. It was pretty cheap so we weren't expecting much. Staff were super friendly though! The room is bigger than what i expected. 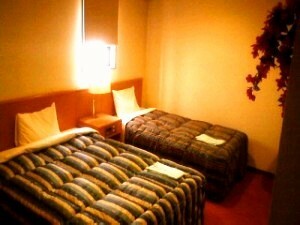 Hotel is near to train station ( 2 - 3 mins walking distance) , convenient store ( 7- eleven & family mart). Staffs are nice and helpful. Highly recommended !! 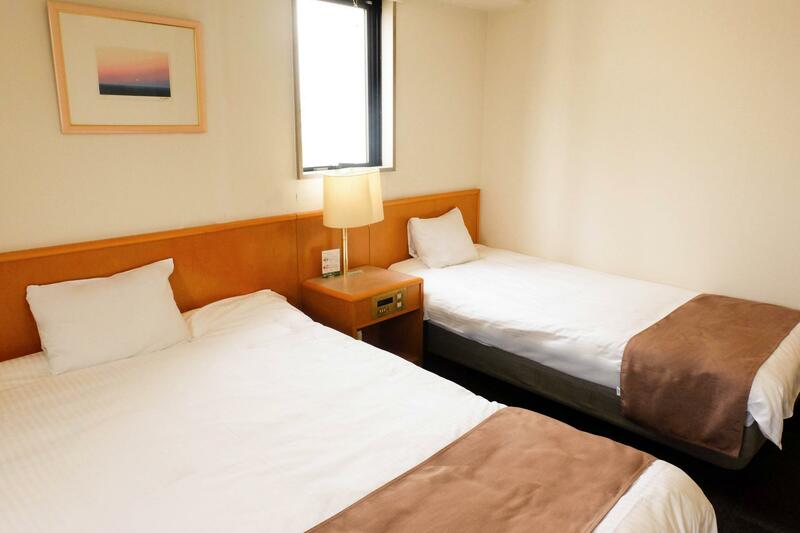 We booked this hotel for it's price and proximity to Shinjuku and were not expecting much. They didn't have any non-smoking rooms available to we were put in a smoking room but the staff had cleaned it so well you couldn't even tell. The beds were comfortable and the room cleaned everyday. There was a mini fridge and kettle and TV, loads of bathroom amenities, more space than I expected for a Tokyo hotel room and robes and slippers. It was also only 200 metres to the subway station, about 50 metres to a 7/11, one stop away from Shinjuku and really easy to find. The staff were very polite and nice. Value for money and exactly as in the pictures (as opposed to most other hotels in the world). Good location (metro is a 150m walk away), very quick internet, eloquent staff, some freebies (even a bit more than expected from a two star hotel), and a few restaurants/convenience shops near by The hotel was extremely clean - probably the biggest advantage of the hotel. Overall, very happy with the choice - Japan can never let you down, even if it's a 2 star hotel. 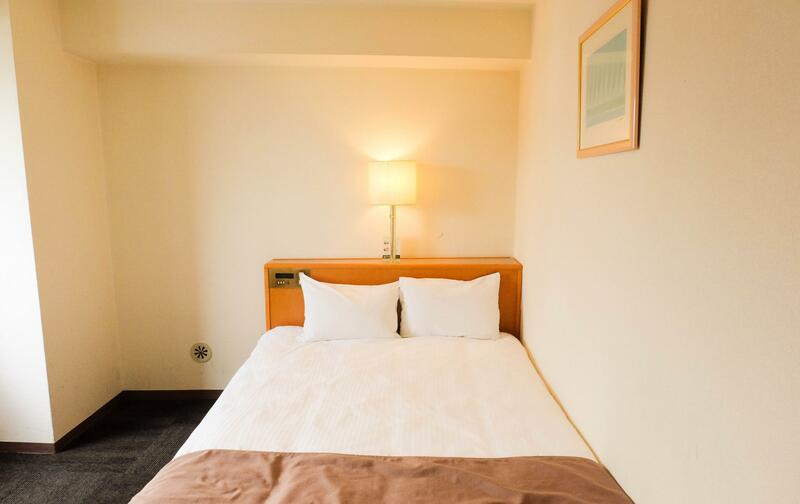 Pros: - cosiness - very clean and neat - has all the essentials you need if you're out most of the time exploring - comfy bed - friendly staff and daily housekeeping - super convenient location (2mins walk from Akebonobashi metro station which is just 2 stations from Shinjuku and just minutes away from 7-11 and good ramen places) Cons - we didn't really have any issues but I'd say as a warning to very tall or large people that the bathroom is quite small (can barely fit 2 average-size people at a time) with the shower being especially tiny if you're over 170cm tall. - you might be left with limited floor space if you have more than 2 large suitcases because the room overall is small (which is typical of hotels in Tokyo but actually this place is considered bigger than average for the price) - staff speak limited English but are very friendly and will always try to help you as much as they can Overall, we really enjoyed this hotel for its simplicity, service & convenient location. Very close to Akebonobashi Station (2 stops to Shinjuku). First stop is Shinjuku Sanchome then Shinkuju (main access to Kabokochi and JR lines, fare is 180 yen one way to Shinjuku. The room was clean, heated toilet seat, complete toiletries. They have free coffee and tea at the reception area. Staff are very friendly and helpful. There is a 7-11 just accross the street. Hotel is located in a quiet neigborhood. If you stay late at Kabokochi and take a taxi back to the hotel, the fare is around 1000-1500 yen, depends on how many traffic stops. Structure is old, but well maintained I would say. Will stay again in the future! I love Japan!! The problems i had with the hotel we're more of a personal issue, the hotel sits on the outskirts of shinjuku. The only way to travel from it is walking the 1.5k to shinjuku central or use the subway (which is pretty awkward if you're new to travelling it in tokyo) the best form of travel around tokyo is the usual railway system, but this hotel is located quite a bit away from them so you're a little stuck with walking, subway or uber. My other issue with the hotel i think wpuld relate to more people, when they clean your room, they more tidy it up. Our bed sheets, covers weren't changed for new ones at all while we were there. The same stain was in the same place for the 4 nights we stayed, we stopped checking the bed cos we ended up getting pretty grossed out from it. Otherwise you get what you pay for with this hotel, it's small, tidy but it's by no means cramped. Perfect for just one or two people to stay in for a week, I'd recommend no longer than that honestly. Stayed here for 3 nights. Arrived at 10am and put our luggage at hotel. Come back to hotel at 9pm and they already put our bag into our room even we're not check in yet. It's a smoking room but not smelly. They provide air freshener in the room. Staff are friendly and helpful. Even they don't know how to communicate in English but they will try to explain/solve the problem for you. Clean room & bathroom. Bed are comfortable. Air conditioner works well. Location are good. 4minutes walking from Akebonobashi Station, Exit A3. There's a Halal Restaurant a few block from hotel. The location was a 4 minute walk to the subway and even closer to multiple bus stops. Our staff were great! We dropped bags off early and they put them in our room for us. The room was spacious with everything we needed!